It is true that contact lenses are the most favoured visual aid as they are convenient and comfortable. 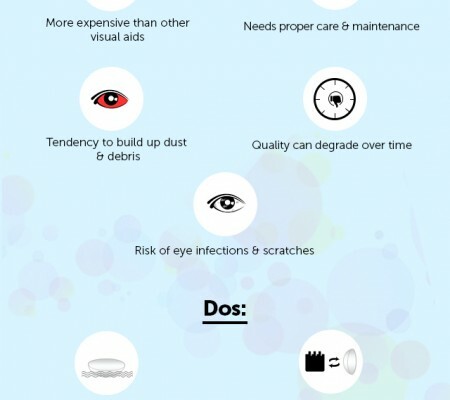 But without proper care and hygiene, they can be the cause of eye infections and other eye-related problems. The task may seem daunting, but proper lens care is inexpensive and less troublesome. They are also not at all time-consuming. Contact lenses are one of the most convenient ways to correct one’s vision. They’re comfortable and do not interfere with one’s activities, like eyeglasses usually do. With the advancement in lens technology and material, contact lenses have become a very successful form of vision correction. Contact lenses are one of the safest forms of vision correction when used responsibly. 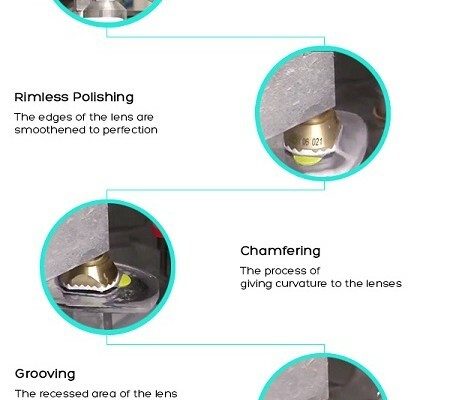 But one has to keep in mind the basic steps on how to handle lenses. 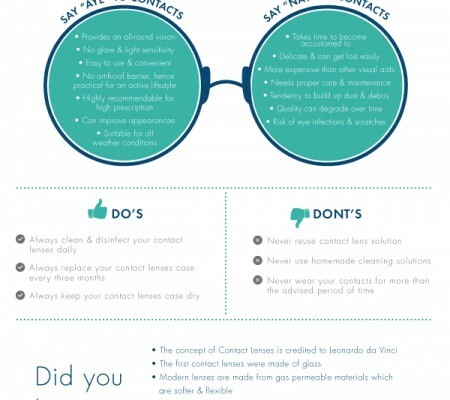 Although it may seem daunting, it is essential to understand contact lenses and how to take care of them. Not taking proper care of your lens can lead to a variety of eye infections, which can cause blindness in the long run. Hygiene – One of the most important factors when it comes to taking care of your contact lens. Before handling your contact lenses, it is highly advisable to wash your hands thoroughly using a mild non-cosmetic or anti-bacterial soap. Touching your eyeball without washing your hands can transfer dirt and germs. This can cause a nasty eye infection. Lens Case –Every time you get a fresh pair of contact lenses, you need to start with a new case. Lens case tends to get dirty which is not suitable for the lens. So, it is also highly advisable to replace old contact lenses’ cases after every three months. Lens Solution – Use only fresh lens solution when cleaning, rinsing or storing lenses in their case. Lens solution serves to disinfect and clean contact lenses. It is not advisable to re-use lens solution as the disinfecting capability of the solution will be gone. Extended wear lenses – One needs to be very careful while wearing contact lens for long periods of time. Wear your lenses as long as you are directed to. If the time period for a pair of lens is four weeks, then it should not be worn for more than that. Dirt and dust particles accumulate on the lenses which may cause irritation, eye infections and even leave permanent damage to your eyes. Resting period – It is difficult to break the habit of wearing contact lenses if you wear them every waking moment of the day. However, it is recommended that you take a break from lenses, so that your cornea can get sufficient oxygen. Rest your eyes a few hours a day by opting for eyeglasses. Contact lens wearers must be vigilant with the safety of their eyes and their lenses. There are some common mistakes that people make over and over again. One of the most common one is using tap water when the solution gets over. Avoid doing this as it is very risky — the water may contain bacteria and germs. Another bad step that is commonly made is putting on contact lenses while bathing or swimming. This again puts you at risk of getting an eye infection. It is also wise not to wear contact lenses overnight. This reduces the flow of oxygen and the surface of the eyes becomes vulnerable to contaminations. It is very important to go for a comprehensive eye check-up every now and then. At the most, a yearly appointment with your optometrist is good enough to keep your eyes healthy. You will know if your eye sight is becoming weaker or improving, accordingly you will get up-to-date prescriptions for your contact lenses. Contact lenses are designed to provide you with the best visual clarity and performance. To guarantee a clearer vision with maximum lens wearing comfort, it is crucial to understand your contact lenses and how to take care of them. Always remember and follow the instructions that come with your lenses and solution. It is also crucial to follow your eye doctor’s directions cautiously.